Now this was a great movie! 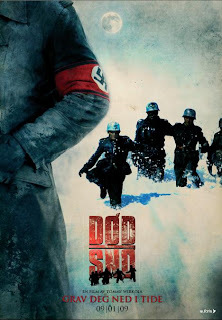 Dead Snow (or Død snø) is the new Norwegian horror flick about the Nazi undead. It has garnered much attention at film festivals around the world, including becoming part of the Official Selection at the Sundance Film Festival this year. Dead Snow is follows a group of medical students who go away on a snowmobile/ski vacation up in the mountains. In the middle of all the fun and games, a mysterious stranger stops by their cabin and informs them that the area they're in is cursed by Nazis from World War II. It's not long before the undead soldiers rise from their cold graves to exact terror on the helpless vacationers. This movie was a thrill ride from top to bottom. There's just something creepy about undead Nazis in full regalia. Amidst all the gore and scares is a lot of humour. Yes it might be a bit dark, but its funny all the same. What plays into a lot of the humour is that the Nazis are never confirmed as zombies. We're given more hints than not, that they aren't, but the poor vacationers just assume they are, which in the end causes more trouble to themselves than the "zombies". I think what helps make it good is that the makers of the film are also big fans of American cinema particularly of horror. There are a lot of visual cues and nods to Evil Dead, Friday the 13th, April Fool's Day, Braindead and heck, even a nod to Indiana Jones and the Temple of Doom. Fans of gore will be more than satisfied by this movie! There's blood, guts, brains, and oodles of intestines to go around. Some of the kills are just so outrageous and over the top that you can't help but cheer. My favourite kill would be of a dude getting his whole head ripped in half vertically. Now I don't know how it's even possible, but it happened here and it was awesome. All the effects and make-up are great. The American horror auteur should take a cue from this movie... stop using CGI! Practical effects are so much better, both more raw and gritty. The costumes and make-up on the undead are great too. Anyhow, definitely, DEFINITELY check it out if you can! This is definitely my first favourite movie of 2009. You can see the trailer here (Youtube). Later geeks! Sounds cool, nazi zombies rule.